Here in Northern California, olive trees grow all over the place. And every autumn since 2004, I’ve gathered green olives from a park near my house to make batches of brine-cured olives and lye-cured olives. Each have their place on my table. I’ve never really been a fan of the typical black kalamata-style olive, so I left the trees alone once their olives began to ripen. I did, however, harbor ideas about oil-curing a batch, but, well, duck season gets into high gear in December and lasts all the way until February. I’d always thought I’d missed my chance. But on day, after duck season ended, I returned to that park looking for mushrooms. We’d had a great rain and I was hoping to find some edible ‘shrooms. I did not find any, but I noticed that all the olive trees still had black olives on them. I took a closer look and noticed that almost all of them were pristine. Olive fly is a scourge on our local trees. The flies lay eggs on the olives and the larvae burrow into the olive, leaving a tell-tale scar that looks like someone branded the side of the olive with a hot pinhead. Normally I have to toss every third or fourth green olive, picking my way through to the clean ones. But these black olives were almost completely free of larvae. I can’t be certain, but what I think happened is that throughout the long winter, all the olives infected with the parasite had already dropped off the trees; rotten olives surrounded each one. By March, all that was left were good ones. At last I could try my hand at oil-curing some black olives. I gathered about three pounds’ worth in no time. Five weeks later, I can tell you that this is a fantastic way to cure olives. In fact, I don’t think anyone ought to pick black olives before March. In three pounds of olives, I had maybe 20 that were infected with olive fly. And the months of weathering on the tree — all that chilling and rain — had already leached out some of the bitterness from the olives. Yeah, they were still awful eaten off the tree, but they were a lot better than a raw green olive. How much salt? It doesn’t matter too much. 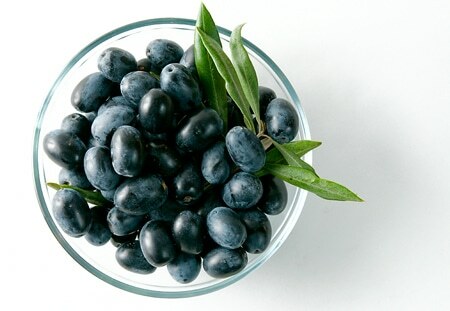 A good ratio is about 1 pound of kosher salt to 2 pounds of fresh black olives. You can go a little over or under this if you’d like, but err on the side of more salt, not less. Pour the salt into the pillowcase, then the olives, and mix them all around so the olives are covered. 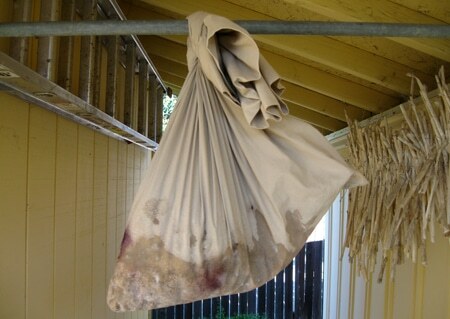 Hang the pillowcase somewhere that black, dripping olive juice won’t matter. I hung the case between the two sheds in our backyard. Yep, that’s right: You can do this outside. Weather doesn’t matter, and some sources say the cure is even better of everything gets rained on once in a while. Attend to your olives once a week or so, to mix them around again and make sure they are still well-covered in salt. The earliest they might be ready is a month, but they should definitely be cured by six weeks. After a month, take one out. The olive should look wrinkly, taste salty and be just a little bitter. These olives will always be more bitter than those done by the lye-curing method. I like that little hit of bitterness. Take them out of the salt when they are “sweet” enough for you, or after six weeks, whichever comes first. You will notice something. No oil. While these olives are known to one and all as “oil-cured,” they are not actually cured in oil at all. They are cured in salt. The oil comes next. Arrange the cured olives in one layer on a cookie sheet and allow to dry overnight. Sometimes a little olive juice gets on them during the curing process, and you want this to evaporate before you put the olives in for long-term storage. 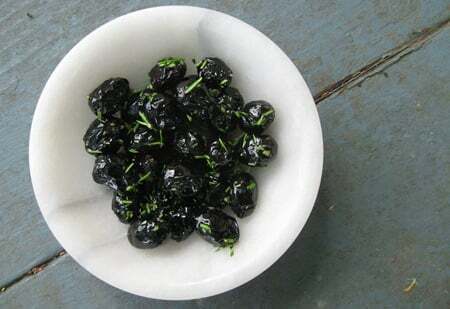 When they’ve dried overnight, mix the olives with about 1/2 pound of salt for every 4 to 5 pounds of cured olives. Store in an airtight container. 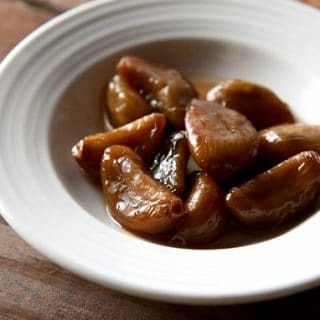 When you want to eat them, some sources say to boil the salted olives for a few seconds to remove some of the saltiness. Boiling will also plump up the olives a little. You don’t have to do this, as the olives are excellent either way. What you do need to do to the olives is marinate them in olive oil for at least a day. This is where the oil-cured part comes in. 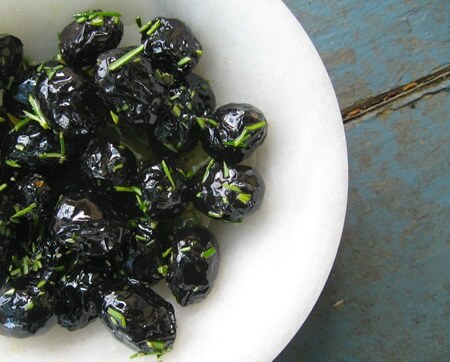 You can completely submerge your cured olives in oil, or just coat them in it. Your choice. Definitely include a chopped fresh herb such as rosemary, sage, thyme or oregano. A little lemon zest would be nice, as would some cumin or black pepper. But don’t gussy up these olives too much. Their allure is in their simple, briny richness. Once marinated, eat the olives within a few weeks or so. 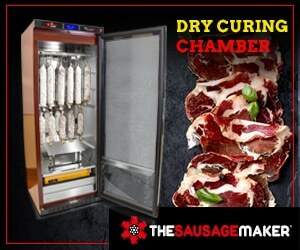 Find all sorts of recipes, methods, tips and techniques for preserving the harvest here on Hunter Angler Gardener Cook. John: Nope. You boil them for a moment before soaking in olive oil later, though.